Attendees will meet at 8:30 AM at the United Verde General Office, which is located north of town on the Jerome-Perkinsville Road. Non-members RSVP here. Price includes a printed copy of the Field Trip Guidebook and Lunch and snack. Price includes a printed copy of the Field Trip Guidebook and Lunch and snacks. Pay online after registering via credit card. Price includes a printed copy of the Field Trip Guidebook and Lunch and snacks. Pay online after registering via credit card. Acknowledgements - The Arizona Geological Society thanks Freeport-McMoRan, Inc. for granting us permission to visit their Jerome property and providing geologists to lead the tour. Field Trip Description - Freeport-McMoran invites AGS Members and guests to visit their United Verde volcanogenic massive sulfide deposit at Jerome in Yavapai County, Arizona. This tour offers an unique opportunity to examine a deposit type that has been overshadowed by Arizona's porphyry copper systems in recent years. The trip itinerary is still being determined, but it will involve stops involving the geology (several in the pit area), examination of core, an historical overview and one or more stops dealing with reclamation work by Freeport-McMoRan. Tour Date/Time - Saturday, April 21, 2018, 9:00 AM to 1:30 PM. Logistics - Field trip participants should plan to arrive at the United Verde General Office by 9:00 AM on April 21, 2018 to complete on-site check-in and wavier signage. The field trip will begin promptly at 9:00 AM. This office is located north of the town on the Jerome-Perkinsville Road. The field trip should end around 1:30 PM. This will provide an opportunity for those who wish to visit the museum at the Jerome State Historical Park prior to its 5:00 PM closing time. Lodging - Participants who choose to overnight on Friday prior to the trip will be responsible for making their own hotel accommodations. Nearby hotels are present in Jerome, Cottonwood, Prescott and Camp Verde. Carpooling - Participant contact information for those who want to make carpool arrangements prior to the trip. Meals - Sandwiches, cookies, bottle water and sodas will be provided for lunch. Level of Difficulty - The level of difficulty is slight to moderate. Only one of the stops will involve a one kilometer hike with an elevation gain of about 600 to 700 feet. Temperature are expected to be in pleasant cool range from 45 to 70 degrees F. Elevation is 1,600 to 1,800 meters (4,800 to 5,400 feet). Bring a light jacket if it is a windy or rainy day. Sunscreen lotion and a good hat to protect the head from too much UV are strongly recommended. Personal Protective Equipment - Personal protective equipment (hard hat, sturdy boots, long pants, reflective vest and safety glasses) will be required. Hand protection is also encouraged (work gloves). A limited amount of these items will be available at the site. Field Trip Preview - Situated along the northeastern slope of the Black Hills, the United Verde mine is located in the Verde Mining District approximately 25 miles northeast of Prescott, Arizona. Initially visited by Spanish explorers in May 1583, this deposit was rediscovered in 1876. Mining operations were carried out by the United Verde Copper Company from 1883 until early 1935, when it was purchased by the Phelps Dodge Corporation. Following the suspension of commercial mining operations in 1953, small scale salvage operations continued recovering remnants of ore that remained in the open pit until 1975. 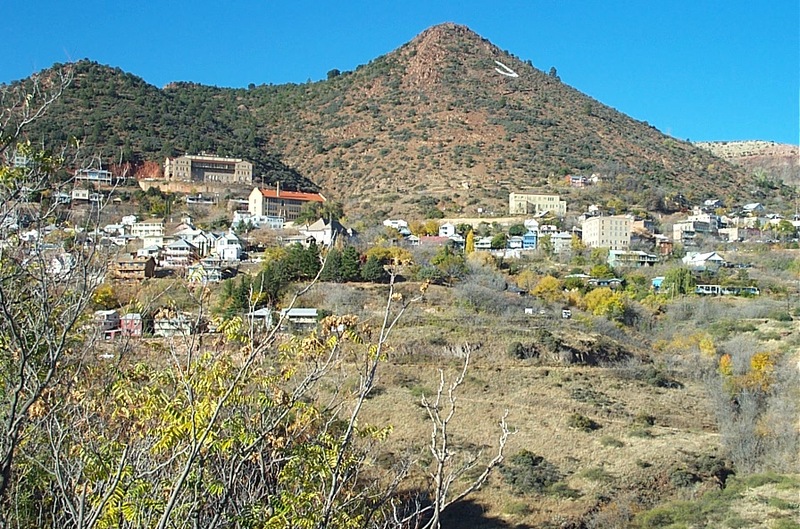 To learn more about the history of the Jerome mining camp visit the Arizona Geological Survey repository for an article titled: History of the Verde Mining District, Jerome, Arizona. 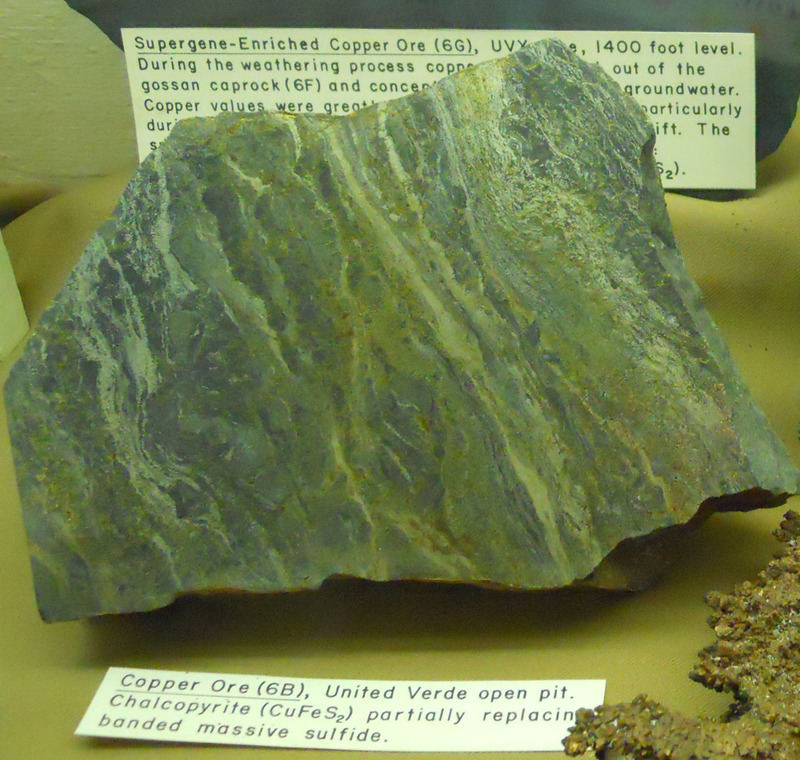 Approximately 33 million tons of ore, averaging 4.8% copper were mined at United Verde from 1883 to1975, making it the largest volcanogenic massive sulfide producer in the United States. It is reported to contain an additional unmined resource of 21 million tons, averaging 0.52% copper and 6.6% zinc. Volcanogenic massive sulfide ores of the Verde Mining District are hosted by the Early Proterozoic Ash Creek Group, a sequence submarine volcanics and volcaniclastics, which was deposited in an ancient intraoceanic island arc. Exhibiting textures similar to modern day "black smokers", the United Verde deposit was deposited on the sea floor above submarine hydrothermal vents at the top of the lower member of the altered Cleopatra Rhyolite, approximately 1,738 million years ago. The black schist zone in the footwall of the massive sulfide deposit is characterized by intense chloritic alteration, which marks the sites of hydrothermal venting in the altered lower member of the Cleopatra Rhyolite on the sea floor. Most of the copper ores at United Verde were restricted to irregularly shaped zones in the lower third of the massive sulfide body and as stockwork-replacement bodies of pyrite and chalcopyrite within the underlying black schist with lesser amounts hosted in zones of chalcopyrite veining cutting sericitized lower Cleopatra Rhyolite. Copper contents of the massive sulfide body generally diminish upward and peripherally outward into zinc-rich zones containing up to 15% sphalerite that are generally characterized by alternating bands of zinc- and pyrite-rich layers about 1/4-inch thick. Unaltered volcanic and volcaniclastics of the upper member of the Cleopatra Rhyolite and tuffaceous, turbiditic sediments of the overlying Grapevine Gulch Formation located in the hanging wall of the United Verde deposit were deposited on top of the sulfide-rich lens and post-date the mineralization These post-mineral units were subsequently intruded by a synvolcanic gabbro, which is represented by a large sill-like intrusive body that occurs in the western hanging wall of the United Verde massive sulfide deposit. Volcanogenic massive sulfide ores at the United Verde mine and its host rocks were deformed in series of open folds that generally plunge north-northwest. It now occurs as a pipe-like body that extends from the surface to a depth of 4,500 feet; plunging 50 to 65 degrees to the north on an axis of about N20W. Unoxidized mineralogy of the United Verde deposit is simple. Characterized by an assemblage composed of 40 to 80% sulfide minerals, it primarily consists of pyrite with lesser amounts of interstitial quartz, dolomite and ankerite. Sulfides other than pyrite (primarily chalcopyrite and sphalerite) constitute less than 25% of the massive sulfide ore. Other minor constituents include bornite, arsenopyrite, galena, tennantite and electrum. The primary sulfide mineralogy at United Verde was modified by weathering and supergene processes, where it was naturally oxidized above the 160-foot level or oxidized by mine fires between the 160- to 600-foot level. Oxide- supergene mineral assemblage includes cuprite, chalcocite, azurite, malachite, native copper, wire silver, copper hydroxides and hydrous copper sulfate minerals. Contact Info - If you have additional questions about the Fall Field Trip contact Wolf Schuh (520) 498-6846, Ralph Stegen (520) 498-6811, or David Briggs (520) 784-3954.